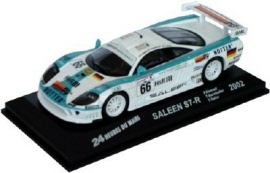 2002 Saleen S7-R - Konrad / Borcheller / Seiler - Le Mans. Made by Ixo for Altaya. 24 Heures du Mans 2002, June 15 & 16. The car finished in 26th (& last) spot with a total of 265 laps. Scale model in scale 1/43rd. Please note that we only have a very limited supply left of these models and that they might have slight wear & tear to the display boxes! 1989 Sauber Mercedes C9 - Mass / Reuter / Dickens - Le Mans - RACE WINNER! 24 Heures du Mans 1989, June 10 & 11. The car won the race with a total of 389 laps. 2002 Dallara Oreca Judd - Beretta / Lamy / Comas - Le Mans. The car finished in 5th spot with a total of 359 laps.